Democrats in the California state Legislature want to revive a controversial community renovation program, and with it, bring back billions of dollars for affordable housing. The program, called redevelopment, was ended in 2011 by Gov. Jerry Brown and a Legislature intent on closing a massive budget hole. Democrats believe their proposal will get a boost next year by the support of the state's new governor, Gavin Newsom. "We think it is the right time to bring back a new version of redevelopment," said Assemblyman David Chiu, D-San Francisco. 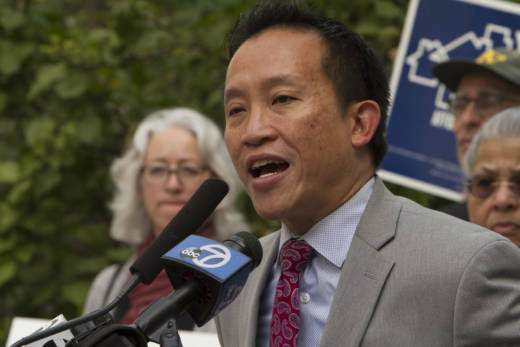 Chiu is introducing legislation on Monday, the first day of the new legislative session, that aims to bring back redevelopment agencies and the roughly $1 billion they provided annually for affordable housing. "None of the [other] funding measures are as robust as the ongoing significant funding that redevelopment provided in the past," he added. Redevelopment agencies were created in the 1940s to fight neighborhood blight. Under a method called tax-increment financing, the agencies were allowed to keep property taxes within their borders that would have otherwise gone to local governments and schools. At least 20 percent of those funds were dedicated to low-income housing. Facing a $25 billion deficit, one of Brown's first moves in office was to propose the elimination of redevelopment. "Redevelopment funds come directly from local property taxes that would otherwise pay for schools and core city and county services," Brown told lawmakers in his 2011 State of the State address. "So it is a matter of hard choices, and I come down on the side of those who believe that core functions of government must be funded first." A 2011 analysis of the governor's proposal to end redevelopment agencies won positive reviews from the nonpartisan Legislative Analyst's Office, which supported Brown's proposal given "significant policy shortcomings" of redevelopment and the need for the state to close a massive budget deficit. Even as the state's economy improved, Brown showed little interest in reviving redevelopment. Now, Chiu and other housing-focused Democrats have an ally on redevelopment in the governor's office. Governor-elect Newsom mentioned the program as a top priority during his campaign. "Mayors have perverse disincentives for housing. Cities collect retail sales tax, they don't collect property tax," Newsom said in KQED's gubernatorial debate. "We would like to have that debate about reallocating that tax base." That position may not sit well with California's counties, which cheered the end of redevelopment. When the agencies were dissolved, counties regained that stream of property tax revenue, said Dorothy Johnson, legislative representative for the California State Association of Counties. "When local revenue is diverted for purposes without the consent or the option of that local agency, that's going to be a consistent problem," Johnson said. While counties would have to participate in the redevelopment process under Chiu's bill, he said cities would refund counties the tax dollars they stand to lose. Taxpayer advocates are wary of the long-term spending that could come from the new legislation. Redevelopment agencies were allowed to bond against the property taxes they captured, in order to fund housing and infrastructure improvements. "We’re talking about borrowing against property tax revenue that in some cases will be on property tax bills for as long as 30 to 40 years," said David Wolfe, legislative director with the Howard Jarvis Taxpayers Association. "Local politicians ultimately are not going to have accountability for that." Wolfe said any projects requiring those bonds should go directly before voters. It's unclear how much distrust of past redevelopment spending remains in the Legislature. By the time they were eliminated, the earlier agencies had become ripe political targets, with examples emerging of abuse and gratuitous spending. "Redevelopment 1.0 had billions of dollars spent on so-called economic development with very little oversight and record-keeping requirements," Chiu said. "Our bill focuses solely on housing and infrastructure." Chiu's legislation proposes a yearly audit of the redevelopment agencies, reviewed by the state controller. A bill introduced by Chiu last session to bring back redevelopment failed to advance out of the Assembly.